Windmill Gland and Knuckle Retrofit. Studies have indicated that some of our customers have encountered reduced pumping efficiency due to pump gland leakage brought about by excess wear in the pumps gland sleeve and gland washer. 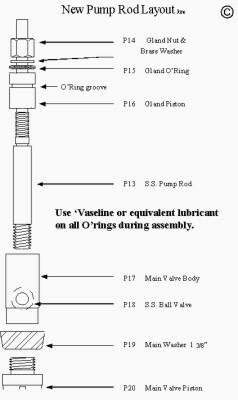 These problems are usually aggravated by poor alignment at assembly time or after pump maintenance. In response to this, in 1997, we introduced some innovations to the Ferguson Windmill which have reduced maintenance costs even further and eased problems that arose from misalignment between the jackrod and pump rod. The first is a new, low friction, synthetic gland piston with fitted o'ring to replace the previous leather cup washer and brass piston. And secondly we designed a multifunctioning knuckle which is fitted in the jackrod to alleviate problems some customers have had in the past in achieving and maintaining correct alignment between the jackrod and pump rod. We recommend that these parts be fitted to existing installations. They now come as standard on all windmills produced since August 1997. As an upgrade offer, a conversion kit, consisting of gland sleeve, piston and o'ring and knuckle joint will be supplied at the reduced price of $155.00 plus p+p. This offer is to allow our customers to convert to the new system and offsetting the cost of a reconditioned gland sleeve and replacement, old style, leather washers leather and brass piston whilst also gaining the advantage of better pump rod alignment and sealing.